Exported ArcGIS Pro maps (.mapx) can be configured using Workflow Manager Administrator 10.5.1 and can later be used as template maps for defining locations of interest (LOIs) in ArcGIS Pro 2.0. The LOI represents the geographic extent of a job. It can be used to provide a spatial context for work or to restrict work to a specific geographic area or point. It can also help managers and users track where edits are in progress to avoid conflicts, prioritize jobs, and coordinate activities among many users and groups. The LOIs for all jobs are stored in two feature classes, one for the area of interest (AOI) and the other for the points of interest (POI) in the enterprise database maintained by Workflow Manager. The LOI can be a single-part polygon, multipart polygon, single point, or multipoint. A job can have either a polygon AOI or a POI. Executing a Define AOI step in the workflow will open a workflow LOI map based on the map template defined for the job type. The layers marked as selectable in the LOI map template will appear as selectable in the workflow LOI map, and all map layers (except the AOI and POI layers) will be read-only in the workflow LOI map. Select one or more features in the map. 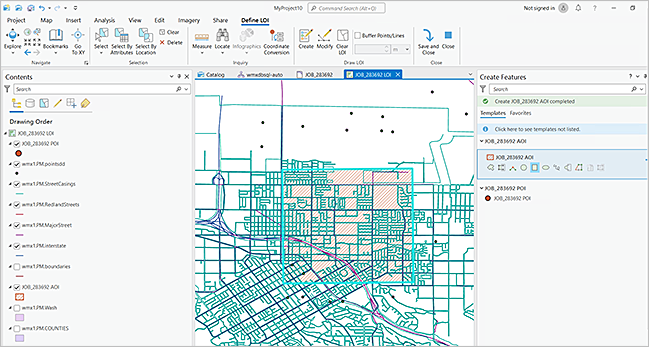 Create new features using the ArcGIS drawing tools. Upon closing the LOI map view, you will be prompted to click Save and Close or Close. If you've selected or drawn multiple features of the same geometry for the LOI, they will be combined into a multipart feature LOI. The defined LOI can be saved by clicking the Save and Close button . If you've selected or drawn multiple features for the LOI, they will be combined into a multipart feature LOI when saving. The workflow LOI map will then close, and the active view will return to the job view. You can clear an LOI by clicking the Clear LOI button on the tab, and you can cancel defining an LOI by clicking the Close button . When you close, all changes in the workflow LOI map are discarded, and the active view returns to the job view. Clicking Close causes the active view to return to the LOI map view. If an LOI already exists when Define AOI is executed, the map view automatically zooms to the existing LOI. This LOI can also be accessed as a bookmark from the Bookmarks drop-down list or pane in a map. If points, lines, and polygons, or only line features are defined and the Save and Close button is clicked, a Saving LOI message appears. Define AOI is controlled through privileges. If you are unable to execute the step, contact your Workflow Manager administrator. If polygons along with points and lines are defined without any buffer and the Save and Close button is clicked, a Saving LOI message appears. Clicking OK will save only the polygons as the job AOI. If the selected points and lines are to be used to define the buffered area around them as part of the AOI, click the Close button , buffer the points and lines, and click the Save and Close button . If the selected points are intended as the POI for the job, click Close, select only the points, and click Save and Close. For more information, see Create AOI by buffering point features in the map and Create AOI by buffering line features in the map. If points and lines are defined without any buffer and Save and Close is clicked, a Saving LOI message appears. If the selected points are intended as the POI for the job, click OK, select only the points, and click Save and Close. If lines are defined without any buffer and Save and Close is clicked, a Saving LOI message appears. If the selected lines are to be used to define the buffered area around them as part of the AOI, click OK, buffer the lines, and click Save and Close. For more information see, Create AOI by buffering line features in the map below. If polygons along with points or lines are defined with the Buffer Points/Lines check box checked and a buffer value specified, the points and lines will be buffered, and the resulting polygon along with the selected polygon will become the AOI of the job when the Save and Close button is clicked. If points and lines are defined with the Buffer Points/Lines check box checked and a buffer value specified, the points and lines will be buffered, and the resulting polygon will become the AOI of the job when Save and Close is clicked. One or more features can be selected from the map and used to define a job's AOI or POI. Using the navigation tools, navigate to the location you want to define as an AOI or a POI. Click a selection tool under Workflow on the Define LOI tab in the Selection group. Choose one or more features from the target layers to be made into the AOI or POI. Click the Save and Close button after you've selected the features. If polygons were selected, the AOI is created; if points were selected, the POI is created for the job, the workflow LOI map closes, and the active view is returned to the job view. If polygon and points or lines, or only line features are selected, see the Both AOI and POI features defined section above for resolution. One or more features can be selected through layer attributes and used to define a job's AOI or POI. Click the Select by Attributes button on the tab. The Select Layer by Attribute dialog box appears in the Geoprocessing pane. Click the layer or table from which to select features. Click Verify to confirm the expression. Click Run at the bottom of the Geoprocessing pane. Features based on your query are selected in the map. Click the Save and Close button after you've selected the features that will define the AOI or POI. One or more features can be selected by location and used to define a job's AOI or POI. Click the Select by Location button on the tab. The Select Layer by Location dialog box appears in the Geoprocessing pane. Choose the input feature layer. Choose the Selecting Features input. Choose the units for the search. If polygons were selected, the AOI is created; if points were selected, the POI is created for the job, the workflow LOI map closes, and the active view is returned to the job view. If polygons and points or lines, or only line features are selected, see the Both AOI and POI features defined section above for resolution. One or more features can be drawn and used to define a job's AOI or POI. On the Define LOI tab, in the Draw LOI group, click the Create button . The Editing pane appears with the AOI and POI feature class for editing. Click the AOI or POI feature template in the Editing pane. Choose the appropriate drawing tool. Using the tools in the Navigation group, navigate to the location you want to define as an AOI or a POI. Click the map to begin drawing the AOI or POI feature. Double-click to finish the drawing. Click the Save and Close button after you've created the features that will define the AOI or POI. If polygons were created, the AOI is created; if points were created, the POI is created for the job, the workflow LOI map closes, and the active view is returned to the job view. If both polygons and point features are selected, see the Both AOI and POI features defined section above for resolution. One or more points in the map can be buffered to create the polygon geometry to be used as the AOI of the job. Select or create one or more point features in the map. Check the Buffer Points/Lines check box. Provide the buffer distance and click the drop-down arrow to choose the unit of measure. Click the Save and Close button . The AOI is created for the job, the workflow LOI map closes, and the active view is returned to the job view. One or more lines in the map can be selected and buffered to create the polygon geometry to be used as the AOI of the job. Select one or more line features in the map. The AOI is created for the job by buffering the lines, the workflow LOI map closes, and the active view is returned to the job view. Warn users when selecting features outside the job AOI—A warning message appears to let the editor know that the selected features are outside the AOI. The editor can choose to continue editing by clicking Yes. If the editor clicks No, the features are unselected, and the editor can continue editing features inside the AOI. Prevent users from selecting features outside the job's AOI—A message appears and lets the editor know that the selected features are outside the AOI, and the features are unselected. Allow edits to features outside the job AOI—The editor can select and create features outside the AOI. Outside—Applies the rules to edit features within the job's AOI as well as features that intersect or touch the AOI. Completely Outside—Applies the rules to edit features entirely outside the job's AOI. This operator ignores features that intersect or touch the AOI. Currently, creating new features using a feature service cannot be restricted with the AOI settings.